JYSK is now hiring globally via RecRight video recruiting tool after a successful pilot done by the HR department of JYSK in Finland. JYSK is an international home furniture and interior design retail company, which was opened in Denmark in 1979. Today, JYSK has more than 2 500 shops in 49 countries around the world, with nearly 22 000 employees. JYSK Finland’s HR department has been a pioneer in developing the recruitment to meet all the global needs of the company. JYSK Finland is responsible for the successful piloting of the RecRight video recruiting tool, which now will be utilized globally in all JYSK countries. The HR team of JYSK Finland consists of three HR professionals, and we interviewed two of them - Leena Saario and Jonathan Laitala. Their team spirit can be sensed immediately from the very first spoken words. Leena has been working as a HR Manager at JYSK for 10 years. Her responsibilities include for instance looking after the Store Managers, doing administrative tasks, improving and training JYSK staff, and ensuring wellness at work. HR Consult Jonathan is responsible for staff improvement, HR systems, building of employer image, campaigns, and organizing trainings. He knows HR systems like his own pockets and works as an administrator in them. JYSK’s has 2 500 retail shops and 74 of them are located in Finland. This means 74 Finnish supervisors who each take part in the recruiting. Jonathan tells how the large number of supervisors means that all of them need to have a consistent way of working – one that supports the company image and brings it out in a correct way. All this is ensured by training the recruiters, and by using the same candidate questions in every recruitment. Leena tells that everyone at JYSK has been very pleased with the video interviews. Sometimes problems arise when new systems are brought to use and old methods are pushed aside. Using the RecRight system was a lot easier than anyone had anticipated, and supervisors have started to utilize the tool happily. The primal focus in JYSK recruitment is that all video answers have a consistent quality. To ensure this consistent quality, all JYSK offices use the same recorded questions in their video interviews. With this method, every supervisor is capable of evaluating candidates equally, and is able to both get and give support to their colleagues. What kind of questions does JYSK ask the candidates? The JYSK recruitment focuses primarily in the candidates’ attitude, not so much in their resume. All questions for the interviews are planned so that they can be answered with short replies. These so- called precise questions help recruiters to find out information, which isn’t available in candidates’ resumes. Local Leaders and Store Managers take part in the planning and the recording of recruitment questions for the interviews. This way the supervisors and possible co-workers become familiar to the candidates via video interview questions. These questions help candidates to imagine how it would be like to work for a JYSK store. All questions are carefully planned within each team. The HR team decided to use same questions in all recruitments for consistent quality and for the possibility to compare candidates better. No matter for what position the candidate lands after their recruitment, the same qualities and skills help the candidate to successfully handle their work. Jonathan underlines that the same traits for successful working are required from all employees, no matter the position or the store location. Successful JYSK employees are self-oriented, sale-oriented, effective, energetic, and quick to learn new things. In the future, recruitment questions will be updated based on the prior experiences and newly gained knowledge of what works the best. The effectiveness of the recruiting has been bettered during the one-year- long pilot. The video interviews have noticeably helped Managers with choosing the right candidates for the second recruitment round. There were many reasons to start the video interviewing in the first place. ”Above all, we wanted consistency and also brand visibility”, says Leena. Leena says that in the big picture, JYSK supervisors pay close attention to details, which aren’t consistent. There are 74 Store Managers in Finland, and each one of them has different working experience. “In the Supervisor Training, we have watched videos and discussed the reasons why some supervisor would have chosen a certain candidate for an interview while someone else wouldn’t have, and what are the reasons for these differing opinions”, Jonathan explains. Based on the gotten answers, the HR team developed a training plan to help supervisors to direct their attentions to the right details when evaluating candidates’ answers. Different interpretations are directed to keep recruiting quality at a high standard. By training supervisors, JYSK wants to ensure that right candidates are chosen for the next round. JYSK has always been an innovative company, and today, JYSK uses multiple modern tools in their operations. A video recruiting tool is a good addition to this. When it comes to jobseekers, JYSK wants to stay in the front lines of companies showing a positively different company image. The active HR team of JYSK Finland has been a key player in bringing new tools for global use. The company headquarters were always informed of the results during the one-year- long video-interview- testing period. During this time, the jobseekers answered over 400 video interviews with thousands of video answers. The positive feedback from the Finnish HR Team convinced JYSK to utilize the video interviews also internationally. The video interviews are seen to create positive employer image as well as to higher the effectiveness and quality of the recruitment processes. The recruiting processes are an important part of an employer image, and therefore, it’s good to be consistent as a company. Generally all JYSK stores in all locations have similar practises, but there are some small local and cultural differences. Generic processes inside a company don’t mean that there is no room for local variations - all units are part of the development and everyone gets their voice heard. At JYSK a company image is not only about the brand image that shows outside but also includes the internal employer image. JYSK informs about the great career opportunities within the company already during the recruiting processes. Leena says how at JYSK the company image and employer image goes pretty much hand in hand. They work very hard for both, and have succeeded in creating a positive image. 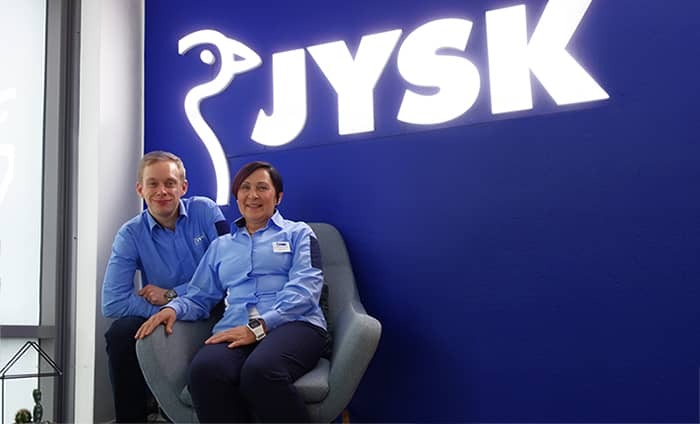 JYSK has a goal to become the number one interior design and furniture retail store in Finland, and also to become the first option for jobseekers as a good employer in retail. It’s stated clearly in the vision of JYSK: “Employees´ first choice in retail” - Black on white – or better yet the JYSK blue on white.